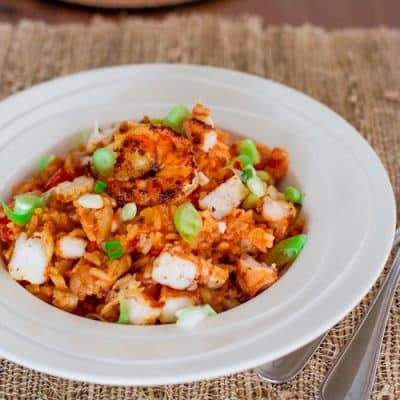 Chicken and Shrimp Jambalaya – a healthier jambalaya that is so delicious it will keep you wanting for more. You all know I love easy and simple recipes. 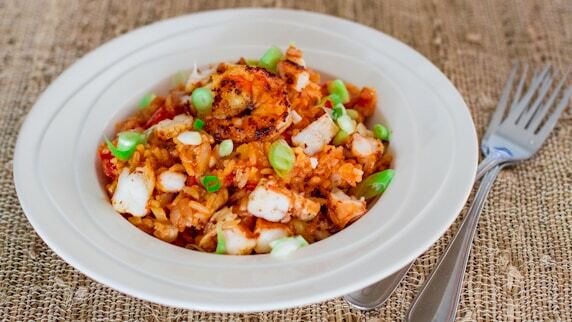 I tried to make this jambalaya recipe as simple as possible. Now I know you might be saying that I’m missing sausages from this jambalaya, but I wanted to make it a bit healthier and so I skipped them. OK fine, I did not have any sausages so please feel free to add a couple. But regardless whether you add sausages or not, this jambalaya was a hit in my house. My picky husband could not get enough, and he’s not a rice fan. I know he hates rice and pasta, what kind of a person is that? But he loved this jambalaya, it had just the right amount of spice in it, and the funny thing is as I was cooking this it didn’t taste spicy at all to me, so I kept adding more and more hot sauce, but I could really feel it when I ate it. So be careful with that. Now for my curious friends, Jambalaya is a Louisiana Creole dish of Spanish and French influence. 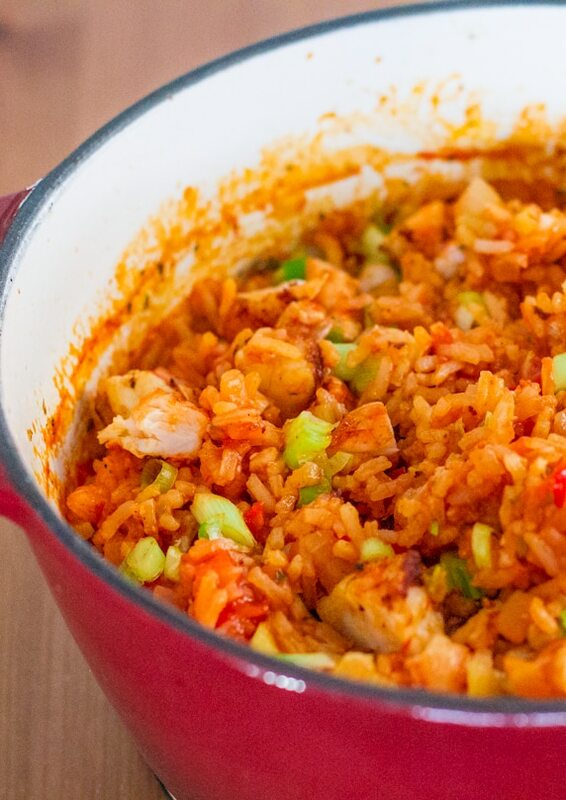 Jambalaya is traditionally made in three parts, with meat and vegetables, and is completed by adding stock and rice. Very simple, but such a delicious dish. You’ll notice that I cooked the shrimp separately and added them to the jambalaya at the end when it finished cooking. This way the shrimp is cooked perfectly and it’s also perfectly seasoned. Another little trick I did here instead of using canned tomatoes and/or tomato sauce I used ready made basil marinara sauce. Seriously, you have to try this, it was perfect. I think I’ve used perfect too many times, but seriously this is how I feel about this jambalaya, it’s simply perfect! Preheat oven to 350 F degrees. In a large skillet or a dutch oven melt the butter and saute onion for 3 minutes until transparent. Add bell pepper, celery and chicken. Cook for 5 min or until chicken is no longer pink. Add garlic, oregano, bay leaves and pepper. Add marinara sauce, chicken stock or water, rice and stir. Cook until it comes to a boil. Add hot sauce, I used about 2 tbsp of hot sauce and it was nice and spicy for me, but if you don't like it so hot, use less. Cover the dutch oven and place in the oven and bake for about 30 to 45 minutes until rice is cooked. In the meant time, clean the shrimp and season with cajun spice. Add the olive oil to a small skillet and heat the oil, then add the seasoned shrimp and cook about a minute per side, until it's pink and a bit crisp. You can cut the shrimp into small pieces or use it as whole. 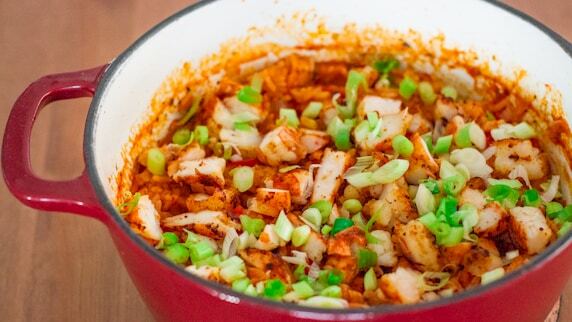 Add shrimp and green onions to the jambalaya and stir. Could I use brown rice instead? I just cooked your recipe and it came out PERFECT!!!! Thanks so much for posting this. It was so good and it was my 1st time making it. Your recipe was truly ON POINT!!!! Keep making more great recipes. What is Cajun spice? If I can’t find it, please tell me hoe to spice it. I have a recipe for Cajun spice here. Do u think I could throw all the ingredients in a crock pot and it would still taste the same? I don’t see why it would taste any different, but I can’t say for sure, haven’t tried this in a crockpot. Let me know if you do try it. If I add sausage, do I need to brown it first with the chicken? can you use instant rice and how would you recommend incorporating it? Jambalaya always seemed like a complicated dish to make, but this was super easy and simple for a novice chef like myself. I added a little crushed red pepper flakes for an extra kick and it turned out delicious! Definitely making this again, great for a crowd. This is going on my menu rotation…have just enough shrimp to make the dish! No shrimp. All I’d be able to get would be frozen from Tel Aviv. No franks hot sauce. We do have that very old one made with peppers and stuff.